This webcast focuses on the business case for radical changes to traditional risk-centric approaches to ERM, including risk registers and risk heat maps, and what is often referenced as “risk-based” internal auditing where internal audit functions as an organization’s primary risk assessors/reporters to better meet board risk oversight requirements. Following the 2008 global financial crisis regulators, institutional investors, credit rating agencies and director associations globally are all calling on boards to radically improve the way boards oversee management’s risk appetite and tolerance and, most recently, the organization’s risk culture. A recent September 2015 survey by Chartered Global Management Accountants (CGMA) commissioned by the American Institute of CPAs (AICPA) and Chartered Institute of Management Accountants (CIMA) that includes results from over 1300 companies globally indicates that over 60% of boards expect management to do more to oversee risk and help the boards meet these new expectations. These developments have profound implications for companies, internal audit departments, and specialist risk groups responsible for ERM efforts. This session has been designed to provide a quick primer on the forces driving the risk management and oversight change mandate and provides practical strategies to help companies, internal auditors, and ERM groups respond. 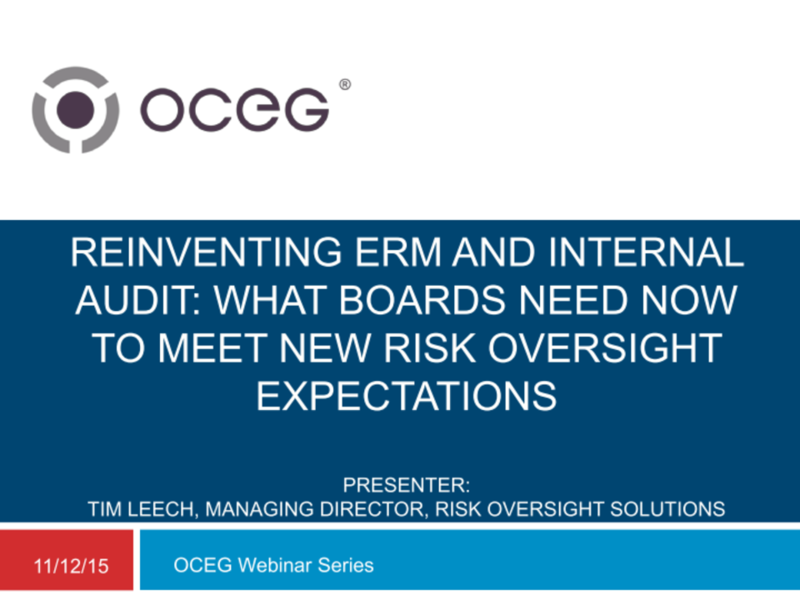 We have emailed instructions to access Reinventing ERM and Internal Audit: What Boards Need Now to Meet New Risk Oversight Expectations Slide Deck to . Make sure the email arrives in your inbox: either add "support@oceg.org" as a safe sender to your email platform, or if you use Gmail, drag our email into your Primary tab.